A vertical drop lay to one side of the road and unconsciously I leaned towards the mountain as our taxi slowly rounded the serpentine curves of the Dinaric Alps of Montenegro. This tiny mountainous country has the well earned reputation of having the most rugged terrain in Europe with its mountain ranges that rise from sea level to an average elevation of 6,562 ft. It makes for dramatic views. 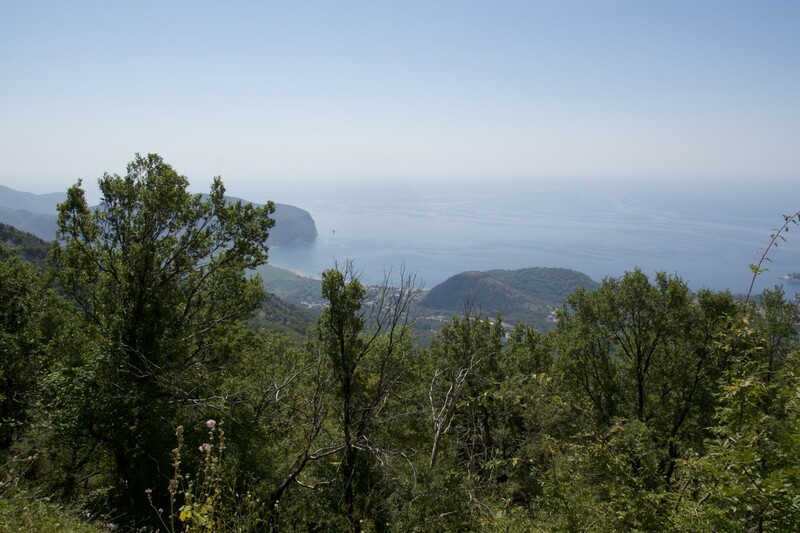 As we reached the summit the breathtaking Adriatic lay below us revealing the narrow coastal plain that meets the steep mountains. This precious swatch of land is only 4 km at its widest and holds many settlements and larger cities along on its rocky shores. The subtropical landscape is a Mediterranean marquis which is composed of a mixture of hardy shrubbery and woodlands and in the late summer heat the air was scented with the fragrance of sage, pine, and tinged with just a touch of salt. The stunning landscape is just one reason we were enchanted by this coastal nation with the other being the amiable people we met. We found them friendly and resilient despite the difficult social and political challenges that their country has experienced and still is. I was surprised as how open they were to talk about the economic problems that they were facing personally as well how this directly affected their town. A concern that was voiced again and again was with the growing Russian influence on the economic and political situation and what that may hold for the future of the region. It was pretty eye opening to say the least. But despite their turbulent history and the uncertain times they were proud of their country and cultural heritage and rightly so. We had arranged for a driver to meet us at the small Podgorica airport and he drove us over the coastal range to the seaside town of Petrovac. The small city is a family oriented tourist destination with many international guests with a large majority coming from Russia. We only found out later that it was known a “Russian town” although one figures that out pretty quickly with the menus in Cyrillic and Russian is spoken everywhere. Their presence grew tiresome as I became less tolerant of the Russian women’s selfie obsession and constant preening for the camera at every possible photographic opportunity. And this is saying a lot for a native of Southern California who grew up in a society that embraces the quest for youth and beauty. Aside from the aspiring Russian models Petrovac was a good location to explore the nearby areas. And that we did making day excursions inland to Skadar Lake and Lovćen National Park, and coastal jaunts to the cities of Budva and Ulcinj. We had hoped that the first week of September would not be quite so hot but it was so we adjusted our activities accordingly. Our Airbnb lodging were simple but the location was convenient. What the room lacked in amenities the host made up in kindness. She was a lovely woman who treated us well and offered us a glimpse into the life of a local family. We met some of her relatives and friends and we joined them several times in conversation and shared their homemade prosciutto, cheese, and potent vodka. After our days activities we enjoyed happy hour and a refreshing swim at the Cafe Club Ponta with its sea level bar and unsurpassed view. And every night we visited a new restaurant reveling in the tasty seafood and enjoyed late nights drinks in the numerous bars listening to local music. Our favorite bar for a closing night cap was the Terasa Castello where they also made a mean Margarita and the cliffside setting was stunning. Petrovac does have its share of problems with abandoned building projects, lack of job opportunities, and Russian drug trafficking, etc. but despite this we found the Montenegrins to be engaging and very charming people. The bus driver deftly maneuvered his coach along the busy route lined with high rise apartments and hotels to our days destination of Budva which is the largest city in Montenegro. He unknowingly provided us with entertainment with his ongoing commentary of greeting his numerous friends or yelling at offending drivers. After a lively ride we were deposited near the Stari Grad (Old Town) and spent the afternoon there strolling the walled stone city and the narrow walkways lined with tourist shops and sidewalk cafes. We found the Old Town limited in what it had to offer of historical importance but the imposing Citadela fortress was an impressive structure that housed a small museum with a library filled with rare books and old maps and was worth the look. The Old Town is oriented to the bustling harbor that is crowded with high end yachts and working boats and the waterfront is lined with endless seafood restaurants. We decided to lunch inside the old city at a shady restaurant that was a welcome relief from the heat of the day. Our eatery was the Kafana Rivijera and a fine choice it was. We enjoyed a cool tomato gazpacho, generous octopus and calamari salads, and a tasty Tres Leche cake topped with fruit. After our leisurely meal we chose to return to Petrovac via scenic water taxi to Sveti Stefan, the famous fortified 2km island dating from 1442. The island town has a venerable history having been ruled and occupied by Venetians and Ottomans and later became distinguished as the summer residence of the Queen of Serbia. Today it still caters to the international rich and famous and is an acclaimed 5 star luxury resort. We admired the picturesque island, disembarked our small boat, bid our friendly driver adieu, and made our way back to our local seaside bar for happy hour and an cool evening dip. Water lily petals covered the surface of the calm inlet as our tour boat made its way out into the open waters of Lake Skadar. The coolness of the wind was a welcome relief from the steaming bus we had taken earlier from Petrovac to the small village of Virpazar that sits on the shores of Lake Skadar National Park. Skadar is the largest fresh water lake in the Balkans and Montenegro shares its shoreline with Albania. In the summertime its waters cover about 370 square miles increasing in winter up to 530 square kilometers. The length is around 44 km by 10 km wide and has an average depth of 8 meters. This wetland is vital to the region and is home to the endangered Dalmatian Pelican that is one of the largest of its kind measuring from a whopping 160-183 cm in length and has a wingspan from 290-345 cm. It is one massive bird. In addition to the pelican there is a myriad of other birdlife with over 260 species represented making for a birder’s paradise. Our small vessel was filled with the obligatory aging Russian beauties, a group of young Montenegrins, a few families, and overall it was an interesting collection of travelers. We had chosen an English speaking tour but that was not to be as our Russian tour guide informed us she had had only two months of English although we were quite impressed with the information she did manage to relay. Nevertheless we enjoyed the incredible natural beauty of the emerald waters and the imposing mountains in the distance. We began our cruise with a breakfast of fried sweet balls similar to a doughnut that we dipped in honey, local soft cheese, and of course vodka. Vodka we found was offered morning and night and the portions were always very generous. As the the temperatures rose we were grateful for our shade canopy and we stopped in different areas so that the we could swim in the refreshing waters. Following our four hour ride we enjoyed a delicious group lunch at the Hotel Pelikan where we feasted on tasty fish soup and fresh trout while chatting with our table mates. Afterwards we were free to roam about the small fishing village of Virpazar where we visited the small museum and learned about the area’s history and sites that include the remains of 15 medieval Orthodox monasteries dating as far back as the ancient Slav Zeta Dynasty from 1360-1421, several fortresses, and even an island prison. The control over the strategic lake was one of ongoing struggle with the Venetians, the Ottomans, and the Hungarians all vying for position along with the Ottomans who had managed to hold onto it for five centuries until the beginning of the 19th. The land surrounding the lake is fertile and is known for the small wine producing region of Crmnica that is considered to produce the best wines of Montenegro from the red varnac grape. Montenegro can prove to be quite a challenge when traveling solely by public transportation especially when trying to reach the mountainous interior. So we ended up renting a car for a day to visit a few inland sites that led us up winding roads and down steep terrain that proved to be a bit harrowing at times. Our first stop was the Old Royal Capital of Cetinje that was founded in the 15th century and sits in a valley at the base of the Lovcen mountains. Today it holds the title of the honorary capital of Montenegro. Cetinje in earlier times was an important Montenegrin cultural hub as well as a flourishing Eastern Orthodox religious center. 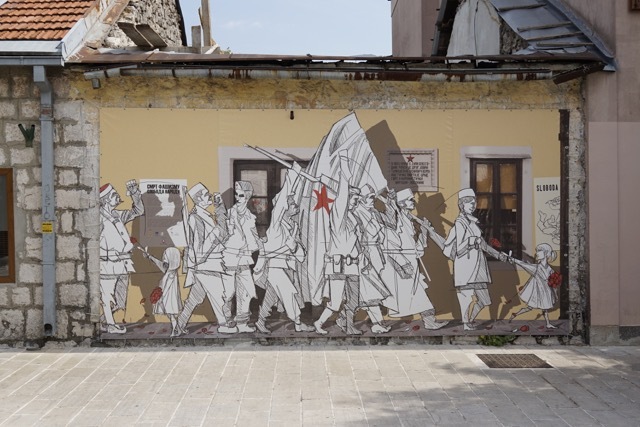 The city also bore the brunt of invading Venetian and Ottoman troops and saw the end to the Crnojević dynasty and the beginning of the Petrović dynasty that ruled from 1697-1918. The outskirts of the city reflected the years of neglect under the Soviet yoke but in recent times with funding from the EU the inner city has received a much needed facelift. The shops, cafes, and sites have been renovated and made for a short but interesting walking tour. We visited the Vlaška Church built in 1450 with its cherished altar and crowns from the old monarchy, and the Ethnographic Museum that had a wonderful exhibition of regional textile artwork. Unfortunately we were only able to visit the exterior of the Cetinje Monastery which is the most famous Serb Orthodox Monastery that was rebuilt in 1785. It was too bad because I was interested in the important relics they hold that include the remains of St. Peter of Cetinje and the right hand of John the Baptist. The roads in Montenegro are not for the faint-hearted. They are often narrow with winding S turns and steep drop-offs, unpaved, and sometimes there are no safety rails. This can make for some heart pounding moments but if one takes their time you can arrive safely at your destination albeit a bit dusty. After our jaunt through Cetinje we hit the road again to find a village nestled adjacent to Lovćen National Park called Njeguši that we had heard about. They reputably make the best prosciutto and cheese (Njeguški pršut and Njeguški sir) in Montenegro so naturally we had just had to visit. We did find the tiny village with a booming 17 inhabitants and lots of feral cats but it was charmingly complete with traditional folk architecture and it seemed as if we had stepped into an earlier time. 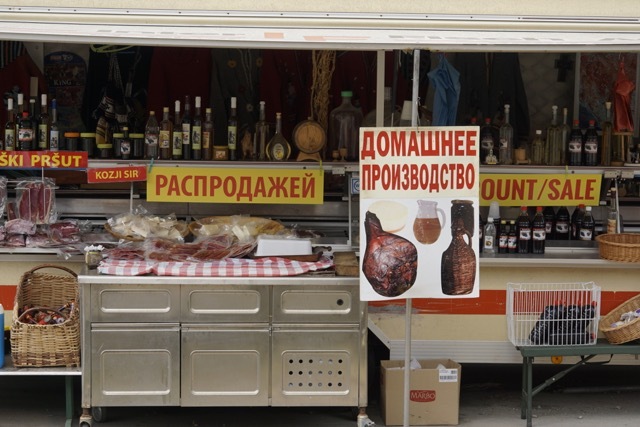 The village also sold many of its own products such as wool textiles and clothing, brandy, and honey. After a short stroll in the village we settled on the restaurant Restoran Konoba koi Radonjica where we enjoyed a typical mountain meal of roast lamb, prosciutto, potatoes, and a sweet cucumber and tomato salad. We also had a nice chat with two retired Swiss motorcyclists who were on a summer tour of the Balkans and they amused us with a few of their adventure stories. We found out later that the name of the village bore the name of the local tribe of the region and was also the birthplace of the Petrović Dynasty. The village attracts many summer tourists fortunately we were traveling in September so the town was relatively quiet. The Lovćen National Park signs beckoned to us so after our meal we set off to find a trail to hike in the rocky terrain. We settled upon a path that promised a striking view of the landscape and we were not disappointed. We encountered no people on the trails and took in the solitude and the lovely mountain flora. The way was pretty rough and karst is not forgiving so one has to pay attention a bit more. Unfortunately we did not have a lot of time left and Franz had to leave climbing to the top of Jezerski Vrh at 1657m and the Njegoš Mausoleum for another time. 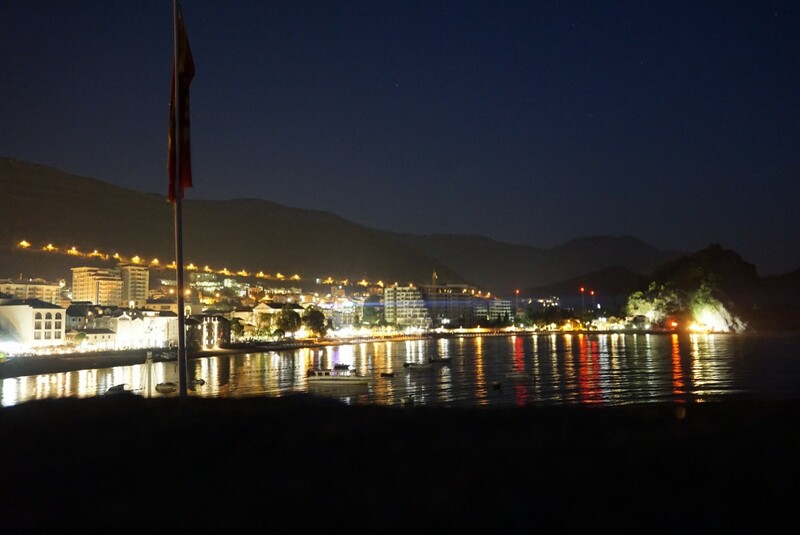 We had a long drive back to Petrovac so we enjoyed the time we had and headed down the impressive mountain road overlooking the famous Bay of Kotor with its commanding view all the way to the Adriatic. It simply takes your breathe away. The 17 km. zigzagging narrow one way road has the reputation as one of the most famous hair pinned road in the world and I can definitely attest to that. I would add nail biting as well. It has 25 of them to be exact with plenty of sheer drops. It was an experience that I was glad to have had but for me once was more than enough. Crossing the bridge over the emerald moat and entering the imposing North Gate into the city of Kotor, Montenegro one is instantly transported back into another time. Within this walled Stari Grad images of the ancient pathways thronging with crusaders, Muslim robed traders, and black clad monks coming together in this cultural hub from the Mediterranean to the Middle East, and as far away as Africa speaking a babel of tongues light up the imagination. Franz and I had arrived from Dubrovnik, Croatia via an easy 2 hour bus ride to visit the magnificent Bay of Kotor which is a well deserved UNESCO World Heritage Site. 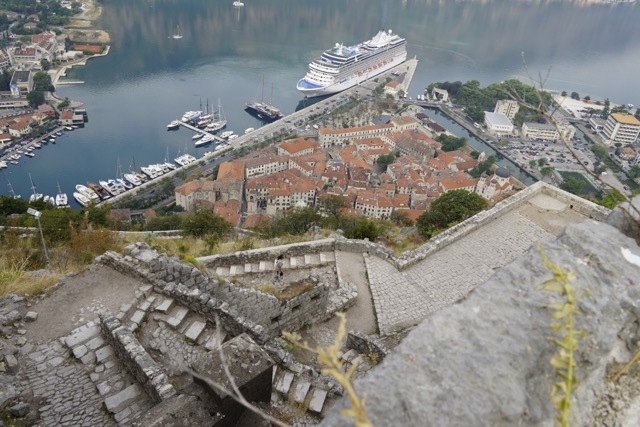 My steady breathing was in sync with my steps as Franz and I climbed the hiking path and the 1,350 stairs winding up to the Fortress of St John that looked down on the Old Town at 820 feet above sea level. We had gotten up early to make our vertical ascent to avoid the heat of the day and the cruise ship crowds. The crisp air was tinged with a faint whiff of smoke from some forest fires in the nearby Albanian mountains but despite the haze we were rewarded for our efforts. 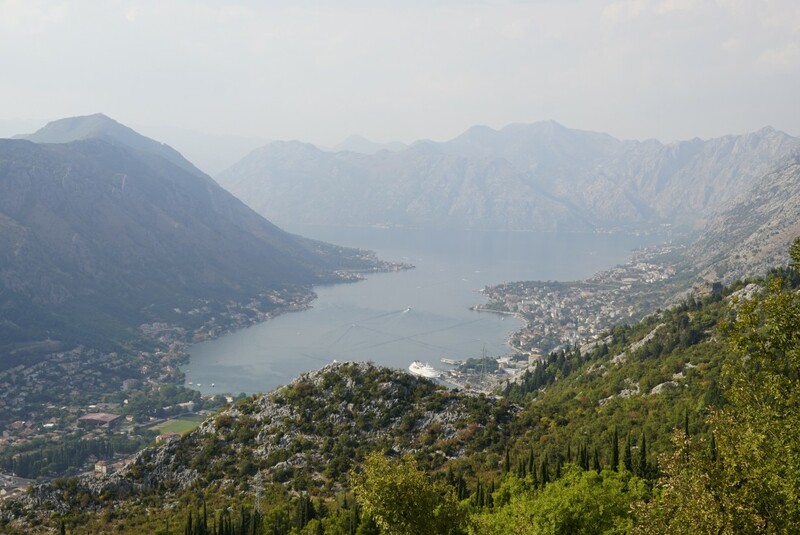 Below us lay the magnificent Bota Kotorska Bay with no one else around and the view was simply stunning. The morning light reflecting off the fjords emerald waters painted a watery rendition of the towering peaks on its calm surface. The bay is the deepest in the Mediterranean Sea and is surrounded by imposing limestone mountains whose faces are lined with 3 miles of defensive fortifications and was quite a building feat in this rocky terrain. After drinking in natures magnificence we made our descent and only then did a few tourists make their way up the trail. We exchanged some pleasantries with a fellow Californian who had been traveling for a few years and it was a welcome respite to trade travel stories and tips with someone from my neck of the woods. As we wandered the harbor looking for a highly reviewed restaurant to book a table for the evening we found the police had blocked off the side streets leaving only the main route open. Soon the sounds of sirens and police cars could be heard leading a motorcade of black tinted limousines to the city. We wondered who these important people were and I offhandedly remarked that it must be the president of Montenegro. Unknowingly we bypassed the security and found the upscale restaurant whose access was also blocked but the entrance was still open. So I walked right up to reserve a place for dinner. The hostess was a bit surprised and informed me they were closed for a private event. Regardless she was friendly and reserved our table for dinner. I inquired what VIP was in the restaurant and we were told that it was the President of Montenegro and the President of San Marino. Of course I had to peek in a bit to see the distinguished guests and inquired as to what they were having. That evening in the romantic setting with a fantastic table and impeccable service we enjoyed the same delicious seafood meal that the dignitaries had had. If it was good enough for two presidents it was certainly good enough for us. A friend’s humorous quip was “Everybody wants to eat where Sharon and Franz do.” Too funny. Our simple lodgings we had booked with Airbnb were inside the old city and its location could not have been better. 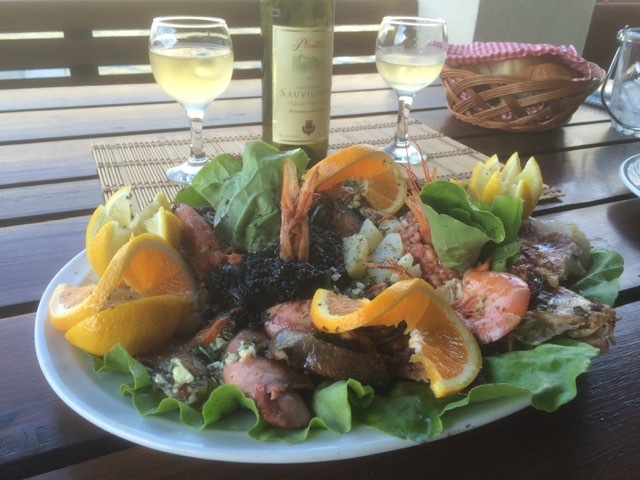 We had easy access to restaurants and bars and enjoyed some typical Montenegrin meals of seafood, prosciutto, and local cheese. The well preserved city is small and in the evening the cruise ship tourists leave and the streets are lively but not too overcrowded so one can get a feeling for the locale. Today historians can’t say when Kotor came into existence but what is known is that it was a Greek settlement inhabited with Illyrians and Romans as well and that it had been written about before the time of Homer around IV-VII century BCE. The city has had a tumultuous past and has been plundered by the Ostrogoths in the 500’s and the Saracens the 800’s and was occupied respectively by the Bulgarians, the Serbs, the Venetians, the Habsburgs, the Ottomans, and lastly the little big man himself Napoleon. This long history of ruler and the ruled made for a fascinating trip into the bygone days of this culturally rich region and provided an excellent location for exploring the mountainous neighborhood.